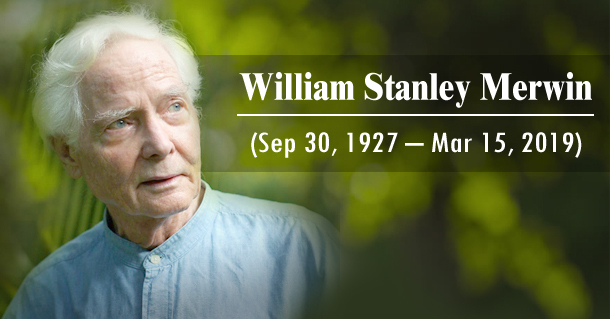 William Stanley Mervin, a noted American poet passed away on the 15th of March in Hawaii aged 91. He was the U.S poet laureate twice and won a National Book Award and two Pulitzer Prizes. A Mask for Janus published in 1952 was his first published collection who started writing by penning hymns for his father who was a Presbyterian minister. The Lice which is Merwin’s most read collection condemns the modern man in visionary terms. The Carrier of Ladders published in 1970 won the Pulitzer Prize for poetry in 1971. After moving to Hawaii to learn Zen Buddhism, his works dealt with his preoccupation with the natural world. He then went on to write about nature with a fresh take on the world he was living in. Published in 2005, Migration: New and Selected Poems was awarded the National Book Award for poetry. A noted translator, his Selected Translations, 1948–1968 won the PEN Translation Prize.